Merry Christmas, My Lovelies! I hope you're having the best Christmas ever! 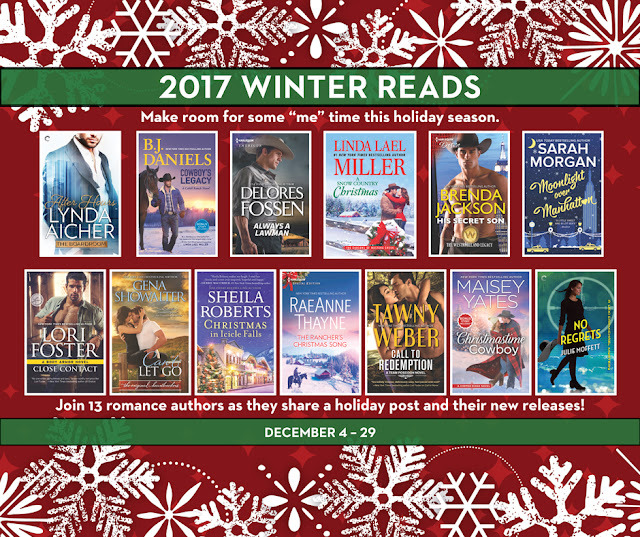 Today I have a little surprise as part of the 2017 Winter Reads Blog Tour hosted by TLC Book Tours. While I'm away soaking up some sun, Shelia Roberts agreed to write today's guest post. Christmas is my favorite holiday and I love dressing my house up for the occasion. Maybe that’s because my mom was so big on making everything pretty and festive. We had special candles that came out every year, an adorable centerpiece she’d made for the dining room table that featured a waving, stuffed Santa going down a brick chimney. She also made a smiling Santa face out of Styrofoam that I still hang on my wall this year. He’s starting to show his age, but hey, so am I. I display him proudly. There was also a large stocking with a stuffed clown and a Styrofoam candy cane sticking out that got hung every year. It had the name Tim hand embroidered on it. That, too goes up. I still remember my kids asking, “Who’s Tim?” Tiny Tim guys! Come on. You watched A Christmas Carol. Of course, the final thing of beauty was the Christmas tree, a glorious one with big, fat colored bulbs and shiny tinsel. That tree was a thing of wonder to me as a little girl, gorgeous all lit up at night and intriguing with all those presents under it. Then, Christmas morning, once Santa had come and added to the treasures, it was breathtaking. My mom set the bar high and I’ve always tried to keep the tradition of holiday lovely going although I don’t have her gift of style. Still, we would put up a tree every year, and decorating it together was a family tradition. But then there came the year we decided to build our dream house and live happily ever after debt free. We moved into what had been our summer cabin and started making plans to transform it into a real house. 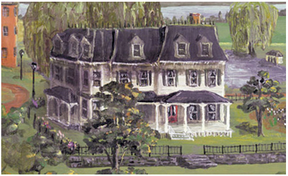 It was a long winter, living in six hundred square feet of drafty bulging with the contents of a three-bedroom house. The freezer was in my son’s room. My daughter’s room was piled with boxes. My husband and I slept on the couch and an army cot in the postage stamp sized living room. There was no place for a Christmas tree. So, I came up with what I thought was a brilliant idea. I decided to pile our presents on the little card table where we were eating and dub it the Christmas table. No one was pleased with this decision. Presents were not the same if they weren’t sitting under a tree! The kids are now grown but the Christmas table lives on in infamy. I tried to make it pretty. Tried to make it cool. I failed. I’m teased about it to this day. In my new release Christmas in Icicle Falls, the final book in my Life in Icicle Falls series, Muriel Sterling finds herself with a Christmas Tree dilemma. No, she’s not dealing with a Christmas table, but she does find herself stuck with a very mangy tree that had looked beautiful when she ordered it on line. What to do? Return it? Take it to the dump? Muriel decides to give the little tree a chance and turns it into a thing of beauty. Muriel’s ugly tree project turns out to be an inspiration for her and her friends as they decide to apply her ugly tree principle to some of the people in their lives – people whose potential they’ve overlooked, people who frustrate and irritate them, people who are the human equivalent of an ugly tree. As I wrote this story I realized that I can take that same positive attitude in my own life. So, this season, I’m vowing to look for the good in everyone and to avoid displaying ugly tree moments myself. And, even though the kids have moved out, I’m still going to put up a tree. No Christmas tables around here because they’ll all be back Christmas Day. I wouldn’t dare give them only a Christmas table. 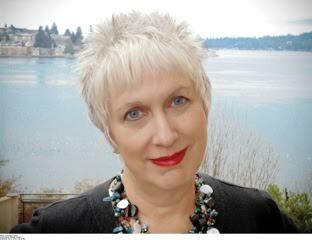 About Sheila Roberts: Sheila Roberts lives on a lake in the Pacific Northwest. Her novels have been published in several languages. Her book, Angel Lane, was an Amazon Top Ten Romance pick for 2009. Her holiday perennial, On Strike for Christmas, was made into a movie for the Lifetime Movie Network and her novel, The Nine Lives of Christmas, was made into a movie for Hallmark . 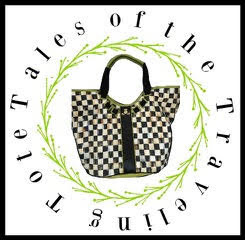 You can visit Sheila on Twitter and Facebook or at her website (http://www.sheilasplace.com). Thanks so much for your thoughtful post, Sheila! I watched The Nine Lives of Christmas on the Hallmark Channel this season. It was fun! 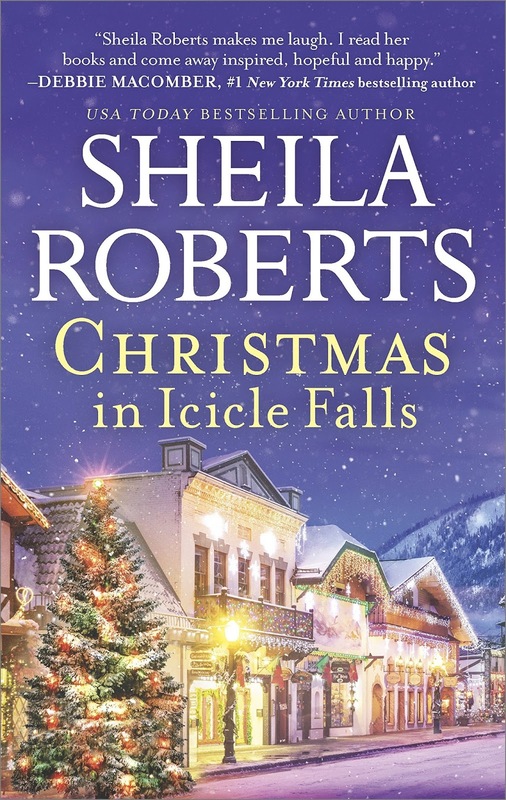 You may read my review of Christmas in Icicle Falls by following THIS LINK. Enjoy the rest of your holidays. I'll be back at the beginning of the new year! I'm sold!I want to read this asap. I love the concept of applying the ugly tree principle to my life. I think it will make a lot of situations in life a bit easier. This sounds like such a good book, it is going on my to read list. Thank you Sheila for telling us first hand about your book, and your other works, I look forward to checking them out! Enjoy your vacation Ricki Jill! Thanks for featuring Sheila for the tour! Sounds like my kind of book. Happy New Year! !